Priyanka Gandhi Vadra’s high profile visit to Lucknow begins on Monday with the UP Congressmen viewing the event as the first step towards the party’s revival in this politically important state. She will be accompanied by her brother and Congress president Rahul Gandhi and general secretary (UP West) Jyotiraditya Scindia. The Uttar Pradesh Congress Committee headquarters here has been witnessing hectic activity with a steady flow of partymen determined to make the most of the event and the “Indira is back” slogan. Hoardings, banners and posters have come up all over the city, particularly the route on which the trio will travel before they reach the Congress office. The cavalcade of the Congress leaders will be accorded a welcome at 18 different points between Chaudhary Charan Singh International Airport at Lucknow and the party headquarters located in Mall Avenue in the heart of the city. A slight change in the route was effected on Saturday following security concerns. The leaders will touch important points such as Alambagh, Hussainganj, Burlington crossing, Lalbagh and Hazratganj. They will briefly halt in Hazratganj to pay floral tributes at the statue of Mahatma Gandhi. Similar halts are also proposed for tributes to Bhim Rao Ambedkar and Sardar Vallabh Bhai Patel. The cavalcade, which will be joined by party workers at every point and accompanied by brass bands and dhol players, will then make its way to the Congress office. Details shared by the Congress office reveal that both Priyanka and Rahul will offer floral tributes to the statue of Rajiv Gandhi at the headquarters. They will also hoist the party flag at a Sewa Dal ceremony in addition to inaugurating the newly-renovated media centre. Priyanka will begin her interaction from Unnao constituency and move up to the Salempur constituency in Deoria, her co-colleague Scindia will take charge of the constituencies between Kanpur and Ghaziabad. A hectic schedule awaits the two leaders who will be interacting with the workers from early morning till close to midnight. 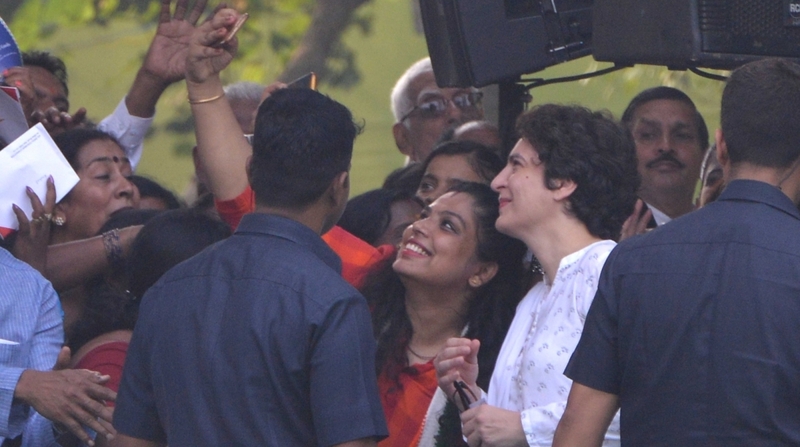 Priyanka’s first meeting is scheduled with the workers of the Mohanlalganj (reserved) constituency while the last interaction slated for Thursday will be with the workers of the Misrikh (reserved) Lok Sabha seat.